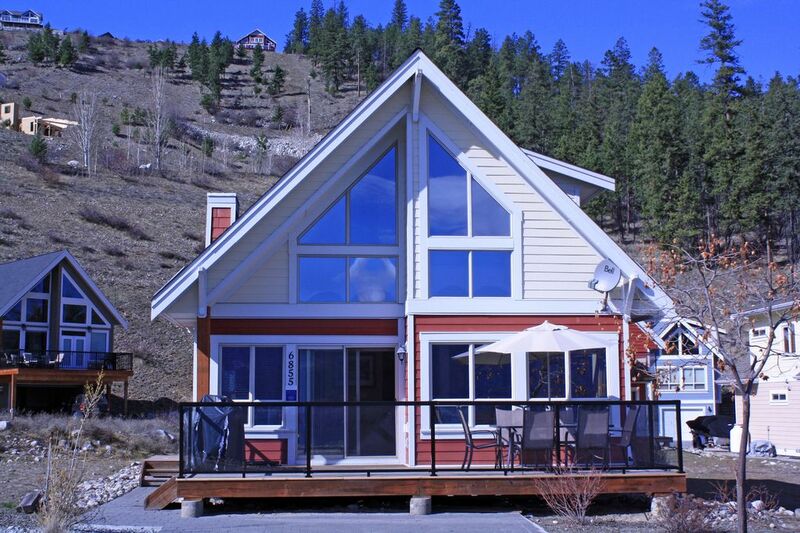 3 bedroom, 2 bathroom, unobstructed views of Beautiful Lake Okanagan. Our Okanagan Cottage has 3 large bedrooms featuring queen size beds, a pull out sofa sleeper by the fireplace, 2 full baths, and a large front deck with an incredible lake view. The GOURMET kitchen includes granite counter tops, stainless steel appliances, and is fully stocked for all your cooking needs. The cottage is complete with washer/dryer and BBQ. Enjoy your coffee as you watch the sunrise on your large deck, and later the same day enjoy dinner and an evenings' glass of wine on the same deck as day turns to night and you relax while gazing at the stars sparkling over the moonlit lake. The kids will enjoy the 150 Mbps Internet speed, its the fastest you can get. Bring your streaming TV device, game console, and connect to the 50 inch 4k TV and watch Netflix, or your other favorite channel, on your own account. You can use our Wifi as we will provide you access to it and you can connect your phones and tablets and save your own data. We have boat moorage available!!! During the summer LaCasa provides guests with numerous amenities including 2 pools, 3 hot tubs, tennis courts, a volleyball court, mini golf, a restaurant (during seasonal operation), kids play area, and a general store. Our beachfront has several tanning decks with loungers and three large aquaparks (trampoline and slides). Make use of the kayaks and paddle boards available at the beach as well. The amenities are open from May Long Weekend till September Long weekend. Bring your boat or ATV, as the trails up the mountain are breath taking! Ride your ATV on the numerous maintained trails or find your own path in the back country. Playing in the Okanagan allows you access to fourteen wineries all within a 1 hour drive of LaCasa including Summerhill Pyramid, Grey Monk, Mission Hill, Cedar Creek, and Quail's Gate. It also has some world renowned Golf Courses nearby. Kelowna is well known for its many locally owned restaurants with an assortment of menus and night life that features a Casino, theatre, or family oriented activities. Personally, we go to the cottage to enjoy the Okanagan and its range of outdoor activities. There are a lot of activities at the resort but we like to use it as our base camp for all that the Okanagan has to offer. Silver Star Mountain is 45 minutes away and is a year round playground featuring Skiing, Snowboarding, and Snow-shoeing in the winter and a Mountain bike park with hiking in the summer. Activities in the area range from zip lining, paintball, biking, hiking, and bungee jumping. Oh yea, there is also Lake Okanagan which is incredible to swim and boat in. Do yourself a favour, come enjoy the great Okanagan, right on the lakefront. You will not regret it! For years we visited the Okanagan and camped in the summer and in the winter stayed in one of the many hotels. We first took our family to the LaCasa resort in the summer of 2014 and we met my parents there. We loved it right away. While there we talked about owning a place there and by November the same year we had bought a place. The Okanagan is incredible and is a nice place to meet up with my family who live near Edmonton and ourselves located in Vancouver. My parents like having the option of flying in to the airport or driving there and we have the same option. We love the Okanagan and my wife loves to be in a Cottage at a resort - need I say more. You can play in the out doors all year around here and never get bored. Its great to come back to the cottage at the end of the day and relax in comfort. You'll love it. LaCasa resort has many activities for everyone in the family regardless of their age. Check it out on youtube. We have a full 180 degree unobstructed view of the lake. Its a 5 minute walk to the beach. Its a 5 minute walk to the beach and the lake. We are on the side of a mountain with a great view and many walking trails into the woods. 43 Inch Smart TV - you can connect to your Netflix and other streaming services while you stay with us. We have highspeed Internet (150 mbs) so bring your streaming device and plug it in to the TV. SilerStar is 1 hour away and Big White is about 90 minutes. Mini golf on site and many golf courses in the area including par 3 and full courses. Available to all guests at the resort. Available from the May long weekend until Sept. long weekend. Garnet had explained everything since it was a fairly long stay in October. He was also available to answer any questions I had during the stay. The fireplace was giving me issues and was able to have someone out to fix the same day! Place was clean and had everything; laundry, kitchen with everything needed to cook and bbq, Netflix, hs internet and a deck overlooking the lake. And, my dog learned how to swim finally! The pool and hottub do close after the October long weekend. The bar/restaurant has limited hours as well after that. Kelowna is about 30minute drive so make sure you have all necessities/gas when heading up. All of this was mentioned by Garnet so no surprise. Chalet is in very good condition--all appliances working and up to date. We had a wonderful nine days here soaking up all the wonders and wines of the Okanagan valley. The chalet was a perfect place to resuscitate after a long day of exploring. Weather was beautifully accommodating. It was a great place to get away from the city. The view was stunning and the cottage was very cozy. One suggestion would be to have hand soap in the bathroom. The road leading up to the cottage was very narrow and windy. It was especially hard to see at night. Overall, we did enjoy our stay. Garnet's place is immaculate and situated perfectly overlooking Lake Okanagan. It was easy to find, and we had no problems accessing the house. Garnet even met with me in advance to discuss the cottage and available amenities. The house was spotless and abundantly equipped with plenty of towels, a broad array of cookware for us self-proclaimed chefs, and three enormous beds (plus a pull-out sofa). It quickly became home to our small party of four for the long weekend. The resort's general store carries anything you may have forgotten to pack. In fact, a fellow tea addict and I went to the store to look for teabags and when we found that their stock was out, the store manager gave us what he had on hand and restocked full boxes of tea for us the following morning. What service! We didn't have a chance to use the pool or hot tubs, but we did check them out-- they were quiet, clean and a shame to miss! The next time we visit, we'd love to try kayaking and paddle boarding. We enjoyed a lovely barbecue dinner on the front porch the day we arrived. Late one night, we walked the trail down to the docks and sat on the end to watch the stars, which we are often unable to see in the heart of Vancouver. Absolutely, definitely highly recommend! We really enjoyed the cottage and found it the perfect spot to unwind for 5 days with our 2 and 4 year old. Yes, you are a pretty decent drive from Kelowna and Vernon, but La Casa offers so much to do, that we never were bored. As a tip, make sure you go grocery shopping before checking in, as the closest store is at least 20-40 minutes away (depends which way you head - north or south). House is well appointed and our dog found it quite comfortable. My only requests would be to have the owner provide hand soap in the bathrooms. Yellowjacket wasps were a problem, but that is not a result of the house, more just an end of summer annoyance to deal with. Our family had a very enjoyable experience at la casa resort. Beautiful scenery off the deck. Relaxing and peaceful. There are over fourteen wineries within a one hour drive of LaCasa Resort including Summerhill Pyramid Winery, Mission Hill and Gray Monk Cellars. Rates subject to change. Cancellations are subject to a $50 charge.